In automotive electronics networking, the commonly networking standard used is called CAN or controller area network which uses a baud rate of up to 1Mbps. This speed is needed in the control of engine and other critical components of the automobile that requires fast transfer of information. However, there are some areas of control which does not require that kind of speed and hence a slower speed standard can be utilized to save control cost. Some of these areas are the mirrors control, Window lift, seat control and door lock among others. Due to this requirements, a consortium was formed in 1998 consisting of 5 automotive manufacturers (Volvo, BMW, Audi, VW and Daimler-Chrysler), 1 tool supplier (VCT) and 1 semiconductor supplier (Motorola) to look into this. As a result, the LIN (Local Interconnect Network) specifications was finalised on 2 February 2000. The first version of LIN was 1.1 and currently version 2.0 is in use. The most recent development in LIN is the use of it over the vehicle's battery line using a DC-LIN transceiver. Some of the main features of LIN are listed below. One master and up to 16 slaves. No collision detection feature is needed as master initiated all messages communication with slaves. The master is usually implemented with a more powerful microcontroller compared to the slaves as it has to handle more tasks. Baudrate of up to 20kbps. Slower speed is chosen to reduce the effect of electromagnetic interference. Single wire implementation based on enhanced ISO 9141. Simple SCI or UART hardware interface which is available in most microcontroller chips making its implementation cost effective. Self synchronization in the slave nodes without the need to have crystal or ceramic resonator. 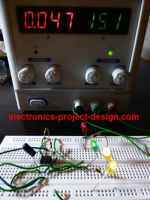 Internal RC oscillator for the microcontroller is good enough and hence making its implementation lower cost. One of the LIN application is in the anti-pinch window lift control. The application note from Microchip uses LIN 2.0 protocol in its implementation example. The microcontroller used is PIC16F688, a 14 pin flash based CMOS device with 4096 words program memory, 256 bytes of static RAM, 256 bytes of EEPROM, 12 I/O, 1 8-bit timer, 1 16-bit timer and 8 channels of 10 bit ADC. A LIN bus transceiver is used for the slave bus driver to connect to network. This automotive battery charger project is based on National Semiconductor LM350 3A Adjustable Regulator. It is designed to charge 12V lead acid batteries. Most vehicles today have remote controls with two buttons that control the locking and the unlocking of the doors of the vehicles. The development of RFID (Radio Frequency Identification) technology will soon replace this method of opening and closing of the doors.